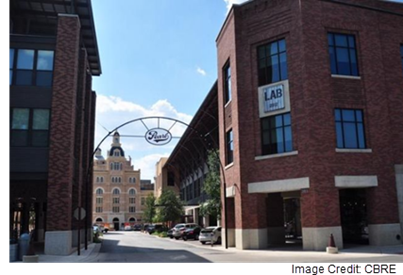 ​​​ SAN ANTONIO – The Alamo city is getting overhang from Austin's tech boom and is starting to attract new types of companies to the area, which is changing the multifamily stock. Nationwide Insurance, JP Morgan and Microsoft have all moved offices to San Antonio in recent years. Additionally, smaller tech startups that might consider Austin office towers to be too pricey have leased up space in Downtown San Antonio, according to Berkadia Director Will Caruth. Despite the growth, one of San Antonio's greatest drivers is its stability, with a median one-bedroom apartment at $871/month. CoStar data indicates Downtown San Antonio has added about 6,000 new residents since 2010, a number that is stronger and broader than the San Antonio metro area. To illustrate, about 75 percent of Downtown’s apartment units have been delivered since 2010. Also, about half of the apartment units in Far West and a quarter of the units in Northwest, roughly 15,000 units, have been delivered since 2010. ​​Want to learn more? Check out Multifamily Market Research from San Antonio-New Braunfels.